Ahead of the Chinese New Year festivities, VistScotland invites you to join Scots all over the world in raising a dram of whisky to Scotland’s national poet, Robert Burns, on his birthday, 25 January (also known as Burns Night)! Robert Burns was born on 25 January 1759 the village of Alloway in Ayrshire in Scotland. He died just 37 years later, at his home in Dumfries. Despite his short life, Burns left a huge catalogue of poetry and songs that have been enjoyed and spoken aloud for over 200 years. Burns is known as Scotland’s national bard or poet! Burns Night marks the anniversary of Robert Burns’ birth on 25 January each year. 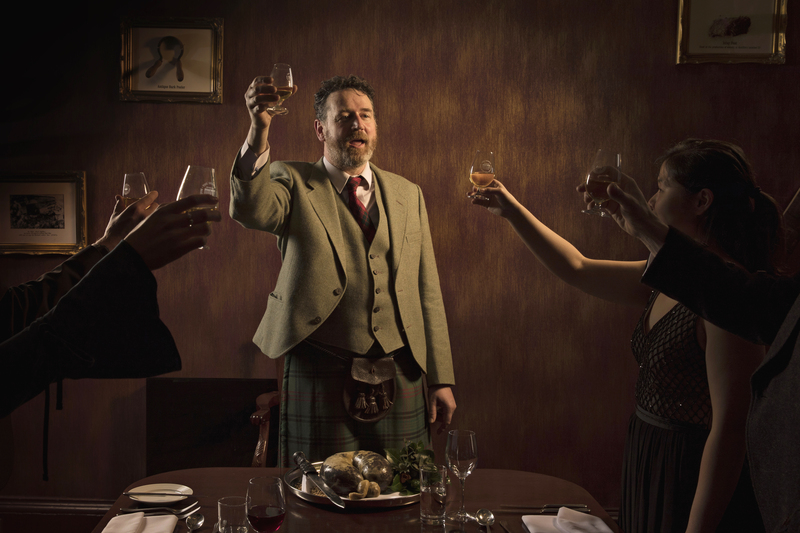 It’s a very Scottish celebration of his work through an evening of haggis, whisky and poetry. What does a Burns Supper involve? Everyone enjoys a hearty feast on Burns Night which includes haggis, neeps (turnips) and tatties (potatoes), rounded off with drams of whisky and lots of Burns’ poetry! 1) To start – everyone gathers, the host says a few words, everyone sits and the Selkirk　Grace is said. 2) The meal –the haggis is bagpiped in, the host performs the Address to a Haggis, everyone toasts the haggis and the main meal is served. ‘And there's a hand, my trusty fere!’. A Burns supper with a twist, the world’s biggest contemporary Burns celebration runs for 11 days at the end of January in the vibrant capital of South Scotland, Dumfries. The festival takes place in bars, art galleries and museums offering music, comedy and, of course, haggis! A brand-new festival celebrating Scottish culture from Burns to the present day. The Museum of the Moon at the iconic St Giles Cathedral on Edinburgh’s Royal Mile is a definite highlight: a new touring artwork by UK artist Luke Jerram which is a fusion of lunar imagery, moonlight and surround sound. Also featured in Burns and Beyond is Red Red Rose Street, a week of celebrations in the city centre that includes a Burns Supper, a free family Ceilidh and Burns Club comedy nights. To get into the spirit of Burns Night, the Royal Yacht Britannia is hosting a ticketed traditional Burns supper aboard the famous ship. Guests will be welcomed aboard by Britannia's piper to experience an unforgettable Scottish evening. A delicious four-course menu will be served in the State Dining Room by Britannia's butlers. Featuring the very best Scottish ingredients, dinner will be prepared by Executive Chef Mark Alston and his team in the original Royal Galleys. Traditional Scottish music will be played throughout dinner by Britannia's musicians and the Address to a Haggis will be followed by a Whisky Tasting in the State Drawing Room. Burns an’ a’ that is proud to celebrate 260 years since Burns was born in South Ayrshire in 2019. This year’s festival includes Burns Birthday Celebrations at the Robert Burns Birthplace Museum, the World's First Burns Supper Drive Thru and the only Burns Supper in the world to take place in Burns Cottage (where Robert Burns was born).